Forest and atmosphere sampling tower at the research site. 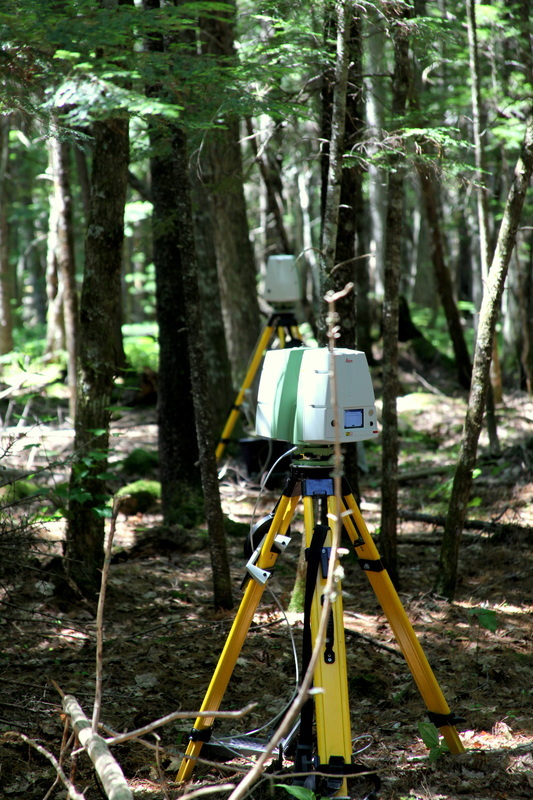 In July 2010, I traveled to the AmeriFlux Howland research site, in Howland Maine, to obtain detailed 3-Dimensional distributions of vegetation area density and the architecture of dominant trees. More information about the Howland site can be found here and here. 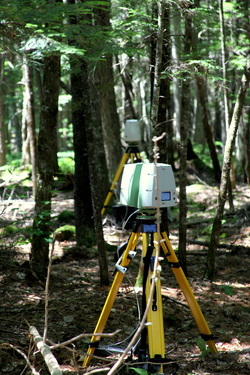 Previously, 3-D data of the trees at the Howland research site have not been recorded, so an exploratory experiment was carried out in the summer of 2010 in which two Leica Geosystems C10 terrestrial laser scanners were deployed in two study plots (Tower Plot:~1405 m2 at 5 different scan locations; White Pine Plot: ~600 m2 at 4 scan locations). Each of these was scanned at 1 cm x 1 cm horizontal and vertical spacing at a range of 30 m. The information gained by these surveys is critical to improving 3-D modeling of aerodynamic interactions between turbulent coherent gusts and group tree-sways in an ongoing NSF funded collaborative research project at the Howland research site. The results of this experimental work will be used to guide the design of a planned full-scale terrestrial laser scan of the entire study plot being investigated by the NSF-funded project.